Have you ever considered making your own jewellery, or giving that special gift with the personal touch? We hold a number of classes for all abilities; from beginners looking to try something new, to those with some experience wanting to build on their existing skills. 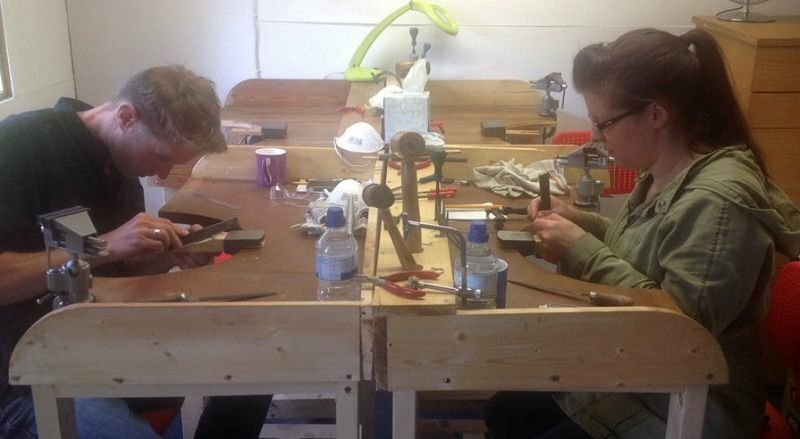 Our beginners classes have been designed to ensure you go home with a number of pieces of solid silver jewellery. Complimentary drinks are available throughout the day and there is an option to have lunch provided. classes can be arranged. Please contact us to discuss your requirements. Alternatively why not hire some bench time by the hour? You’ll have the use of a comprehensive range of professional quality tools to complete your own project (Silver and tuition not included for bench hire). texturing and polishing. All tools, equipment and silver are included in the course fee. There are a maximum of 4 students per class ensuring plenty of one-to-one tuition throughout the day.